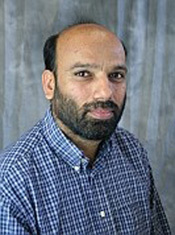 Farhat Beg, Professor in the Mechanical and Aerospace Engineering Department has been named an IEEE Fellow. He is being recognized for contributions to “high intensity laser matter interactions and pulsed power pinches”. The IEEE Grade of Fellow is conferred by the IEEE Board of Directors upon a person with an outstanding record of accomplishments in any of the IEEE fields of interest. The total number selected in any one year cannot exceed one-tenth of one- percent of the total voting membership. IEEE Fellow is the highest grade of membership and is recognized by the technical community as a prestigious honor and an important career achievement.